In 2018, we’ll be making the effort to transition our code base to be Java-9 compatible. This entails a lot of tasks and it will take a while, but we’ll get there. Along the way, we’ll have to drop 32-bit support for Windows and Linux as Java-9 is 64-bit only. On FrostWire for Android (Basic and Plus) there is a really important Privacy Protection feature for VPN users. FrostWire will detect if your VPN connection drops and if you have this setting activated FrostWire will automatically stop all BitTorrent transfers to protect your privacy. This is a really important setting if you want to protect your privacy on the Internet as you won’t accidentally be transferring or sharing files using your local IP address. How to use VPN-Drop Protection? Remember! In order to use this feature you will need a VPN. You can order a VPN on FrostWire! Starting FrostWire 6.4.6 as our first experimental feature we’re introducing a Privacy Protection feature for VPN users out there. 2. 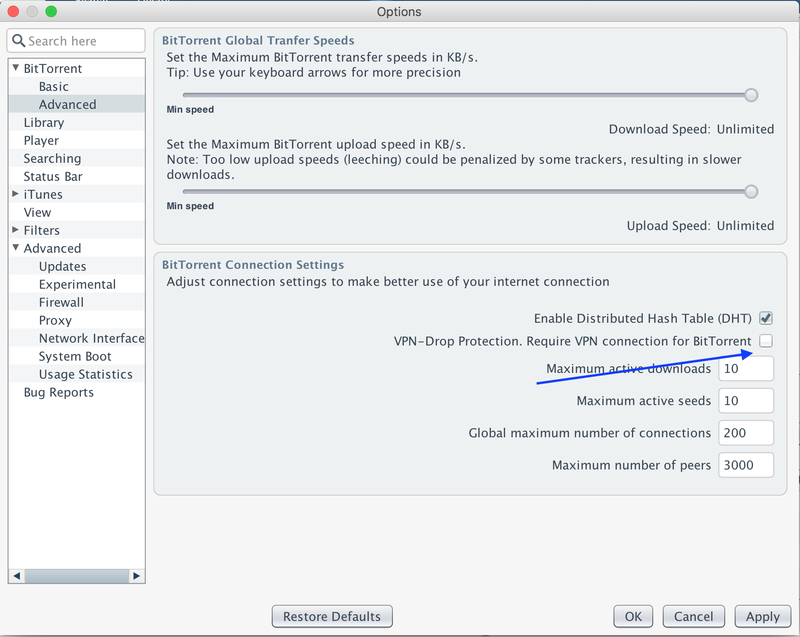 On the same setting screen go to BitTorrent > Advanced and check the box. Then apply settings, and the protection should be on. Warning, this is an Alpha feature, use at your own risk. 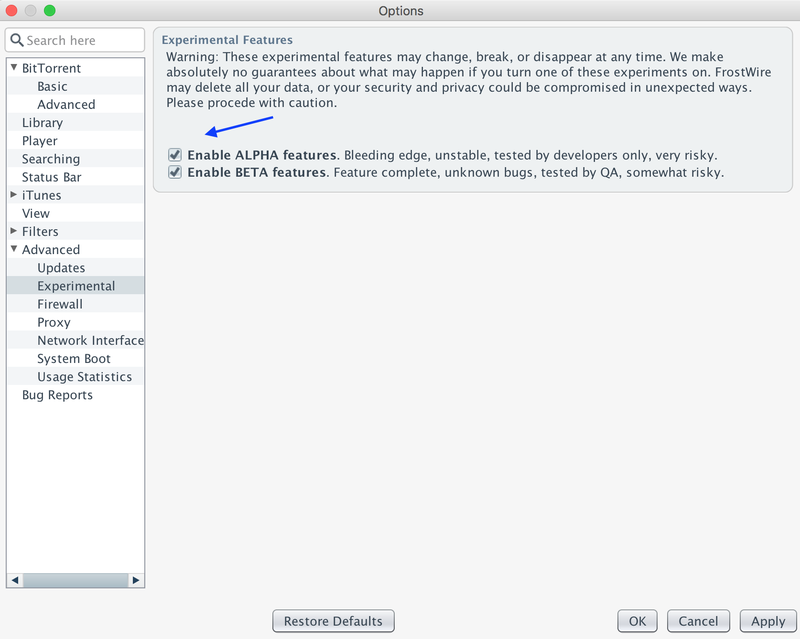 On our next release it could be promoted to beta as we continue to test and optimize And then show the screenshot of the warning and how the feature works. Get FrostWire Plus for Android (1.8.4)! We’re happy to announce a new version of FrostWire Plus for Android. This release includes a lot of important fixes. If you have been having problems getting results from YouTube, you must download FrostWire Plus 1.8.4 right now! Also, we fixed some bugs, now you are not going to get any errors with transfers larger than 6Gb. Get FrostWire 6.3.4. for Windows, Mac and Linux! New Media Player Included! Big News! Today, we are releasing a new FrostWire version (6.3.4) for Windows, Mac and Linux.This update features a major upgrade.Now, FrostWire includes a new Media Player build based on bleeding edge mplayer +1.3.0 and ffmpeg +3.0, which not just allows you to play a lot of videos you might not have been able to play before, it’s a faster player which uses your computer CPU more efficiently, featuring over 2 years worth of upgrades by hundreds of open source contributors worldwide. Moreover, this new MPlayer previews fine all YouTube audio/video. It supports VP8, VP9 and HEVC codecs, so now you are allowed to watch millions of videos. The new Mplayer features over 2 years of fixes and upgrades in audio/video technology included. Our YouTube search has been fixed so expect more search results after the update! YT audio preview issues, video playback issues. VP8, VP9, HEVC support.